BRISBANE'S Carly Day has gone against the grain in business, with a little help from "friends" Bob Marley, the Jamaican Consulate and the humble Budgy Smuggler. Drawing on her Jamaican, Chinese, Irish and British heritage, Day last week added to her West Indian product line The Ja Joint with concept venture The Yard Party - taking corporate social responsibility and diversity to a new level by recruiting staff from marginalised communities. The Ja Joint encompasses a line of traditional Jamaican food products and catering options, while The Yard Party is about promoting a multicultural Australia Day, drawing from The Ja Joint concept and product line. Ja Joint products are sold through select Queensland stores, online and catering options. They have been highlighted as the best in the country by the Jamaican Consulate of Australia, despite being in the market for less than three years. "When I came to Australia eight years ago and learned of the indigenous history, it fuelled my desire even more to create a business around the empowerment of marginalised groups," says Day. "Even coming from the UK, I found it really hard to find employment that represented my skillset in the media, and also employment that drew on my experience working as a caring assistant, so I went through about five years of working in jobs that I was overqualified for. "The Ja Joint kicked in for me about three years ago and was actually a process of me identifying with my own roots due to my mixed background. 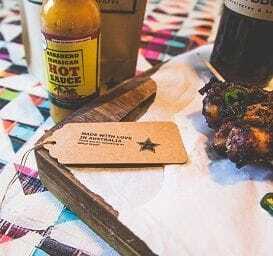 "It has snowballed really quickly for a number of reasons - people don't know too much about Jamaican food so they are curious, they think the accent and culture is pretty funky maybe because of Bob Marley, and they want to support the story behind it all." Jennifer Baabe and Dico N'diaye, two of the The Ja Joint's 11 contracted staff, are African refugees who have been recruited from Africare Community Services in Logan. "We are the first business to team up with the guys from Africare, and they have access to hundreds and hundreds of people in underprivileged positions," says Day. "My aim is to replicate the business model in Melbourne and Sydney, not necessarily establishing restaurants, but having catering and manufacturing spaces in both cities. "Jennifer and Dico are the founding members of our Crew Member Development Program, and my intention is for them to develop the skills that allow them to then employ locally within their own communities." Jennifer and Dico's employment is provided through the sales and production of The Ja Joint and The Yard Party kits, which are packages of authentic Jamaican sauces, rubs, recipes and novelty items. Much of Jennifer's salary reaches her family in Sudan, and Dico's goes towards building a new life in Brisbane, following his arrival in Australia more than 10 years ago from Guinea. "It's important to me because I know there are a lot of people out there who really have no opportunities, and when you have no opportunities, you get depressed, fall into bad habits, and basically waste your life," says Day. "Jennifer hasn't worked properly in eight years and keeps getting told by organisations that she needs to find employment; to find employment she needs to do a course; she does a course and then the potential employer hears her thick accent or sees her skin colour and she's back at square one again. "If you get knocked back for eight years, I challenge anyone to still be confident from there and think they can make a difference in the world - and I'm directing that at someone in a privileged position, not an underprivileged position." Kicking off her campaign for equality is The Yard Party, through which she started retailing kits last week including Jamaican jerk rub and barbeque sauce, recipes, a voucher for Budgy Smuggler and a hand-signed letter from Dico and Jennifer - all in the name of a multicultural Australia Day. To maximise reach, Day is harnessing social media and the hashtag #theyardparty, encouraging all Australian residents to attend their own yard party and embrace their roots. "I was originally going to put more of a political spin on The Yard Party but decided against that as there can already be enough divide and negativity on Australia Day," says Day. "Now it's about putting a positive spin on the day, with a main driver of making people more aware of the issues we face as a nation."